HO model railroad person wanted. Dr. Meyer's office has an HO scale model railroad running around the perimeter of the office. Landscaping needs to be done for more than 200 linear feet of track! Creativity is encouraged. Rivet counting not necessary, and in fact creativity is encouraged even if it is at the expense of scale. For instance, a Lego structure might look cool next to a field of dinosaurs. Green army guys and Lincoln Logs work very well together, especially when there's a train running thru the scene! Also, there will be an interactive section for kids to play with. For instance, switches to turn on a moveable part of the layout, or turn on lights in a house, or rotate an antennae, or cause a steam engine to blow it's horn, and so on. 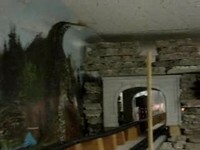 Non-functional sections of the layout, to be constructed, can make use of the large amount of decorative rolling stock and other materials already owned by the office. This layout can be dramatic! Here's your opportunity to come play and get paid for it. There are lots of toys which need to be incorporated into our layout! The DCC system is installed but could be made more interactive. Please help! Routine track and rolling stock maintenance also needed, like oiling, dusting, and whatever else you think is necessary. This unique layout has lots of potential for functional and decorative advancements. More than one person will be considered for this position, and hopefully a team of enthusiastic people can perpetually evolve the layout. What experience do you have? What do you like doing, and what are you not too keen on doing? Some form of a "resume" will be requested. Wages and benefits commensurate with experience. Do you have dental needs? An "exchange of services" can be considered. Please feel free to ask questions by calling the office at (607) 324-1032, or emailing Dr. Meyer at jpmeyer@jpmeyer.com.